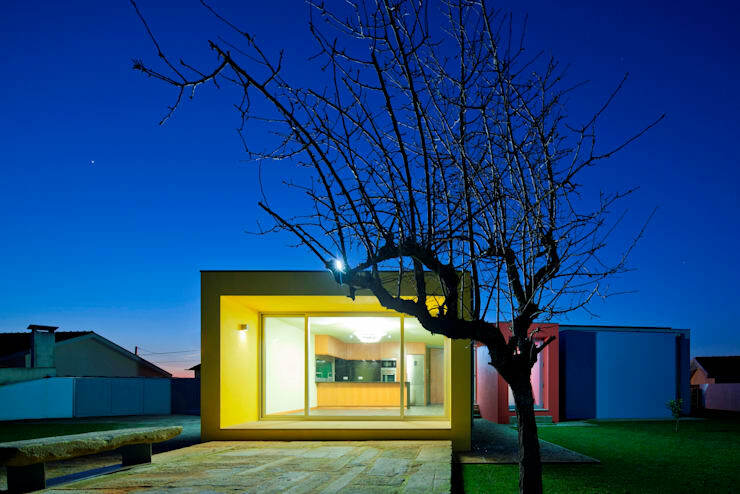 Designed by Portuguese architects, Nelson Resende Architects, Casa No Sobral is trendy, modern, colourful, unique and comfortable—all of the best things when it comes to a house! It's also simple and minimalist, drawing beauty from clean lines and the time-old design trick of colour blocking. Allen Klein once said, Your attitude is like a box of crayons that colour your world. Constantly colour your picture grey and your picture will always be bleak. Try adding some bright colours to the picture by including humour and your picture begins to lighten up. When we translate this quote into architecture, we are saying that if you want to live a bold, colourful and exciting life, sometimes it can be just as simple as painting your house in beautiful, bold shades! If your house constantly looks cheerful and exciting, don't you think you will lead a more cheerful and exciting existence? Come on, let's go on a tour of exciting, cheerful and colourful architecture! You'll feel happier just reading this! From this angle we can see perfectly how the architects used the old stone wall from the previous building to create an angle in the architecture, with one section of the house suspended above the ground. The architects wanted to go for a unique concept, creating two distinct physical realities . They have explained, The house is fixed somewhere on the wall, allowing semi-suspension and a duality between creating a very regular image of a house to the public roads and a very arbitrary image on the other side. These are not your average architects. They think out of the box and are keen for fresh, creative and ingenious ideas. You'll notice on this side of the house, the colours are very simple—white—matching the simple, clean lines used throughout. The balustrades are plain and silver, while glass sliding doors open up to reveal the interior of the home. 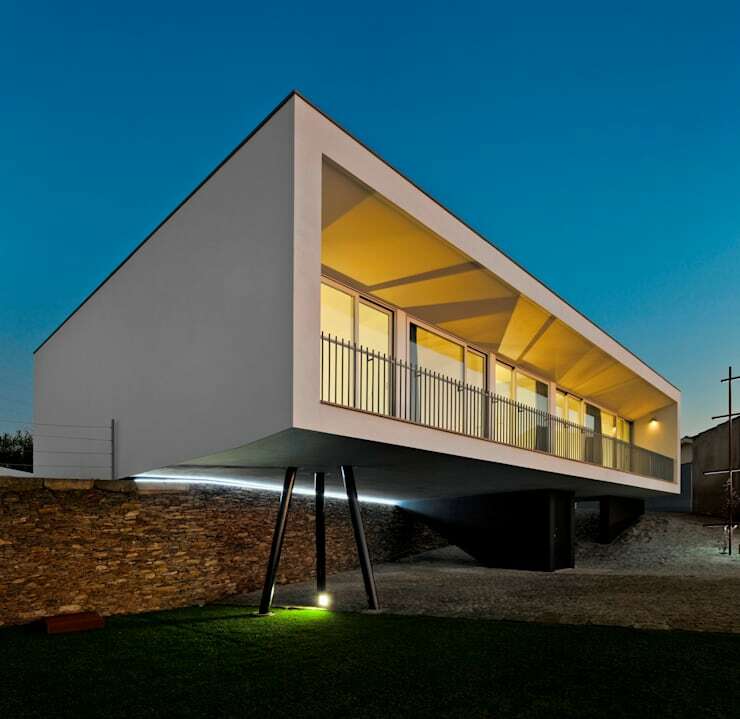 Funky design is included in the form of rods and stabilizers that keep this section of the house suspended off the wall. Have you ever seen a modern house quite like this one? From this angle of the house, we see how eclectic boxes work together to create a unique exterior. There is a tension between how they are so disjointed and yet flow so beautifully from one to the other. A building used to occupy this space, which featured a patio and a warehouse. 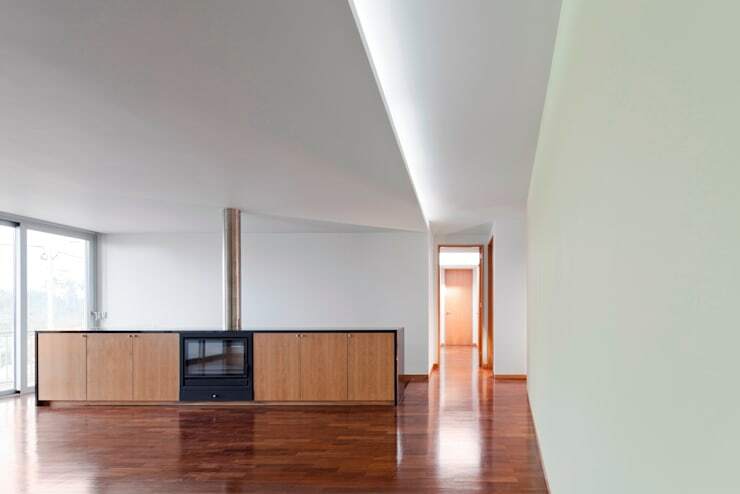 The architects were able to use these elements in the creation of this new, modern home. The result is a stone wall, which allows for this side of the house to remain on a flat, single level while the other side of the house morphs into a double-storey, suspended above the slope. Both sides remain interconnected. The architects have explained that these different levels are meant to give the impression of more space. We will touch more on this later on in our tour. What is impressive, however, from this angle is the cube-like effect of the architecture, where large glass windows and sliding doors reveal a cocoon of a home within. Don't you feel like the interior is on display, like a show window, from this angle? This is one of our favourite angles of the house, where we can see just how fantastically colour blocking can work when it comes to architecture. 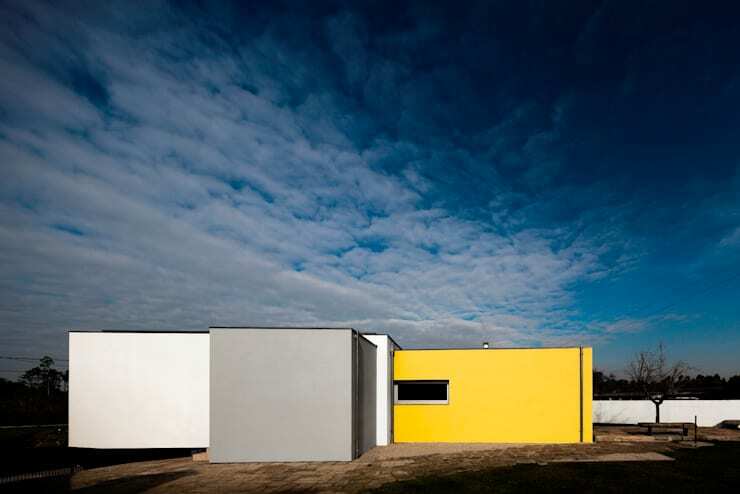 Blue, red and yellow work here against a bad drop of grey, highlighting certain parts of the house. These parts protrude from the main shell of the house, adding a dynamic look and feel to the exterior. 1. Choose your paint carefully, opting for bold primary colours. You don't want anything too bright or too neon. 2. Prep the surface. You don't want to end up with bumps and lumps all over the surface of your wall so make sure it is cleaned and even sanded down if there is old paint that is chipping. 3. If you're working with wood then make sure that you use a primer. This will seal the wood and make the surface much easier to paint onto. 4. Get painting! Use a roller and a some paint brushes to paint each wall evenly and carefully. At points where the walls form a corner, use a small brush to paint the edges carefully, especially if each with be a different colour. 5. Paint a second coat. A brand new house awaits! Check out these paint and finishes products for inspiration. Grey, yellow and white work beautifully together don't you think? And the architects know this, which is why they have teamed the three colours up together in this section of the exterior. The grey and white add a very neutral, minimalist and modern tone to the space while the yellow brightens the area up and adds a splash of colour. This is a great tip both for the exterior of the house and for the interior of the house. We also love the stone base that the house rests on, which gives a very rustic look and feel to the garden, complemented by the lush green grass slightly further off. This image also beautifully portrays how the one section of house flows off the slope, becoming suspended above the ground. It almost looks like an aircraft ready to hover into space! Moving into the house, we can see how the minimalist and simple look translates, without the colours. Beautiful parquet floors flow through the house, while lighter wooden cabinets line the living room. Our favourite feature of this room is the clean, white sloping ceiling. It adds depth and texture to the space, without compromising on style. Light is also incredibly prominent here, where large glass windows allow an abundance to filter into the room. Natural light is really fantastic for any family home, adding warmth to any space without the need for electric heaters. And at night, when it is especially cold, the living room features a gorgeous fire place that is built into the wooden cabinets. If you're looking for a fireplace for your home before winter, have a look through our range of fireplaces and accessories for inspiration. Don't you just want to move in today? We end off our tour on the stone slab that flows out from underneath the house and also features a beautiful, in-scripted stone bench. Out of view is a special, stone basin in the garden. The designers have chosen these rustic, simple elements to add decorative style to the exterior of the house. 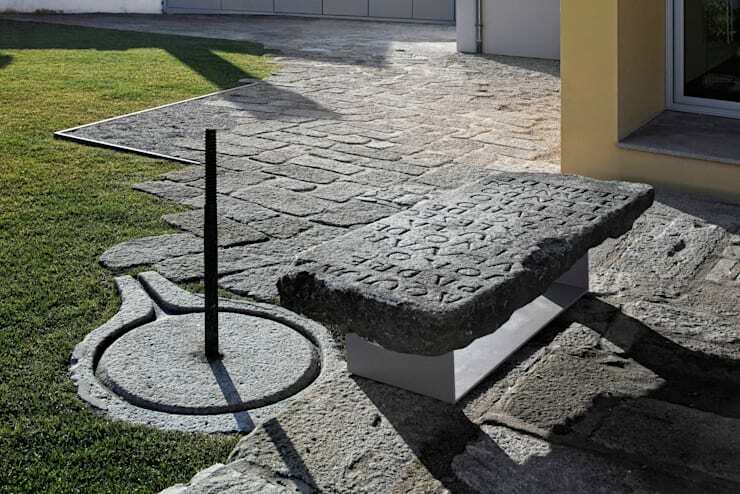 While they could have chosen elaborate garden furniture and detailed designs, they've gone for very simple stone. Why, you ask? Because with a colourful and intricate piece of architecture, you want the rest to remain subtle and understated. The art of beautiful design is knowing what to emphasize and what to let slip into the picture, elegantly and unannounced. Casa No Sobral is everything you want when it comes to inspiration, integrity and award-winning architecture. These are architects to keep an eye on! 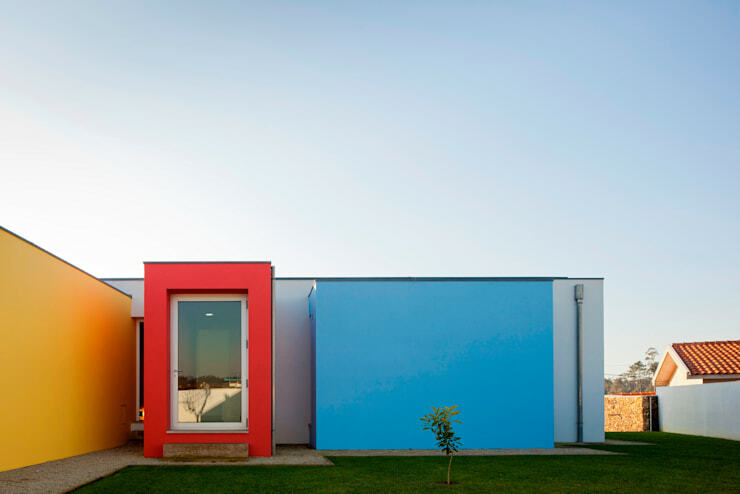 If you like this house, you'll love: The House that Strikes a Pose.